This is an amazing late blooming, perennial plant that deserves to be in every garden. 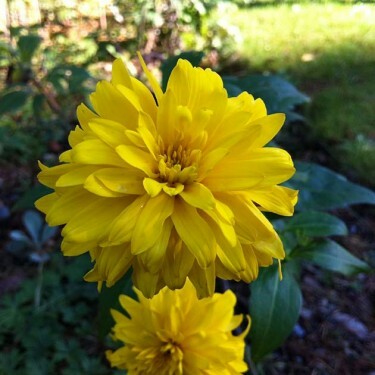 Last spring, I planted a nice sized root in a container and was rewarded with tons of beautiful, cut leaf green foliage and many bright gold, fully double flowers. In my cottage garden they were perfection. The lovely double blooming, lemon yellow flower is long lasting, late blooming and makes a perfect backdrop for other flowering perennials. Also makes a great fresh cut flower. 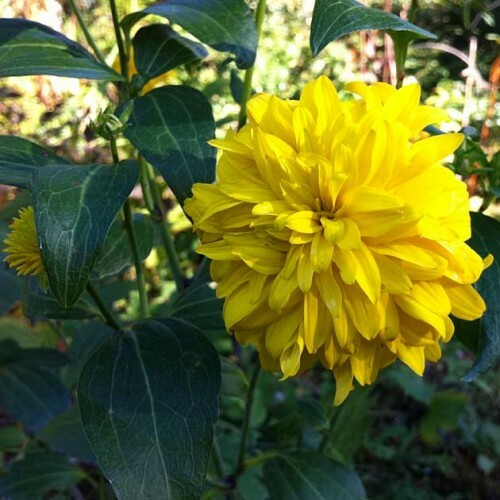 Not your usual Rudbeckia! 'Goldquelle' is a long-blooming Coneflower that is simply packed with double-blooming yellow petals! Rudbeckias, commonly known as Coneflowers are hardy, disease, pest and drought resistant daisy-like flowers that native to North America. Mass in bold drifts in the perennial border, cottage garden or naturalized area. Its sturdy rough-textured foliage makes a perfect backdrop for other flowering perennials. Coneflowers also make good fresh cut flowers.